The article has been updated to reflect that HTC, Microsoft, and Samsung have similar efforts, the latter with an almost identical name. Google's new Motion Photos might have flown under your radar when it was announced last week in the context of the Google Clips, but that's not surprising—there was a lot going on. Since then, we've reached out to Google for more information and, combined with our own hands-on, we've got a good understanding of what goes into a Motion Photo. At a technical level, Motion Photos are approximately 3-second video clips that capture the moments just before and after you hit the shutter for a photo. The videos are 1024x768 MP4s paired with a JPEG of the actual photo. The video resolution isn't very high, but they're automatically captured with no fuss on your end, and it's still higher resolution than Apple's version was at one point (Live Photos may have a higher resolution now, Apple's documentation leaves a lot to be desired). They even leverage Google's snazzy machine learning tech, so the camera is smart enough to automatically edit out blurry bits from both the beginning and end of clips. 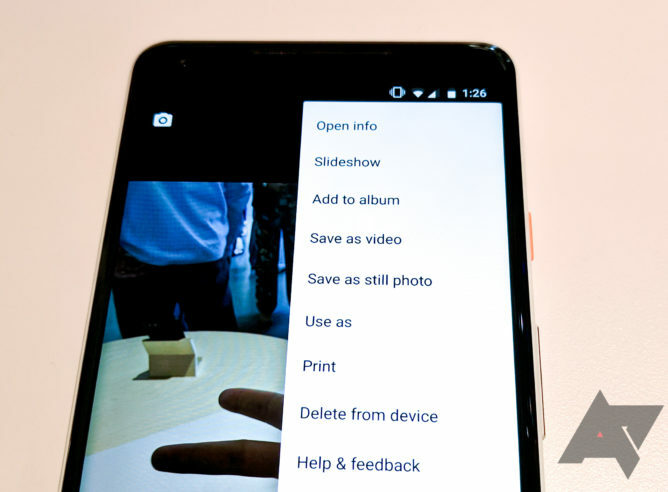 According to our own tests and what we've been told by Google, Motion Photos are stored together with the still photo in a single JPEG container. It should be possible to save Motion Photos you capture directly as videos, which was an option on the demo phones at Google's event (see above). No one outside of Google has been able to take Motion Photos yet, but you can check out how they work via a couple examples shared in Google Photos. Again, if the quality appears to be a bit lacking, it's not just you: Motion Photos are captured at 1024x768. They are not intended to be a substitute for full-resolution video. There are a few new Motion Photos-related options in the Camera app itself, which you can see above in our video. When you capture a photo, there's a new toggle between the rule-of-thirds guide and timer. The toggle has three settings, "Motion off," "Motion auto," and "Motion on," which control when Motion Photos are captured. In the gallery, there's a "Motion on/off" toggle at the top of the screen that switches between the Motion Photo video clip and the associated photo itself. According to Google, playback for Motion Photos will be supported in Google Photos on the web, iOS, and across all Android devices. 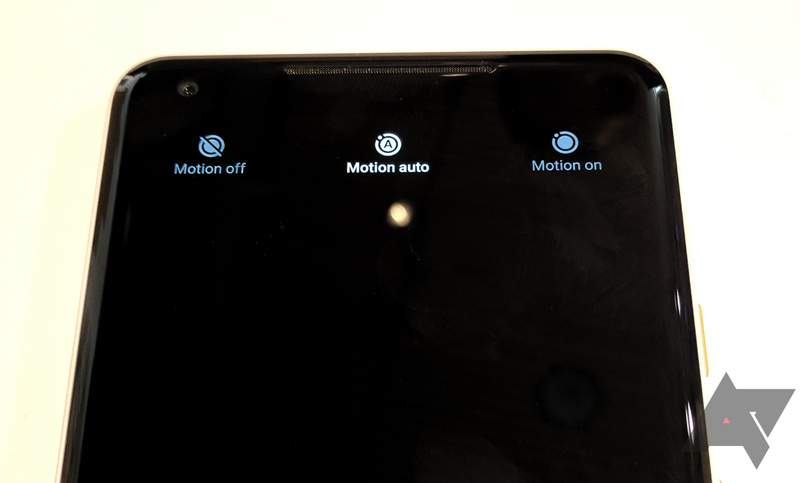 However, Motion Photos can only be captured on the Google Clips and Pixel 2 for the time being. Google is open to expanding it across the ecosystem in the future, but there are no firm plans. Importantly, Motion Photos is different than Google's Motion Stills, although they both accomplish similar functions. In fact, Motion Photos uses some of the same stabilization technology that debuted in Motion Stills. Google expects that both Motion Photos and Motion Stills will continue to co-exist, though. It would be impossible to ignore the similarities between Motion Photos and Apple's Live Photos. Like the ongoing Snapchat/Instagram wars, Motion Photos feels like Google cloning functionality from its competitor. Not that this is a bad thing—at least we're getting the same features on both sides of the fence, and maybe Google can do it better. Samsung's already doing it, Microsoft had Living Images on the Lumias, and HTC had Zoe camera. We'll have a lot more to say about Motion Photos when our Pixel 2 review lands, so keep an eye out. In the meantime, we'll let you know if we find any other good Motion Photos examples.